Streamline and Corrugated water tank profile option! 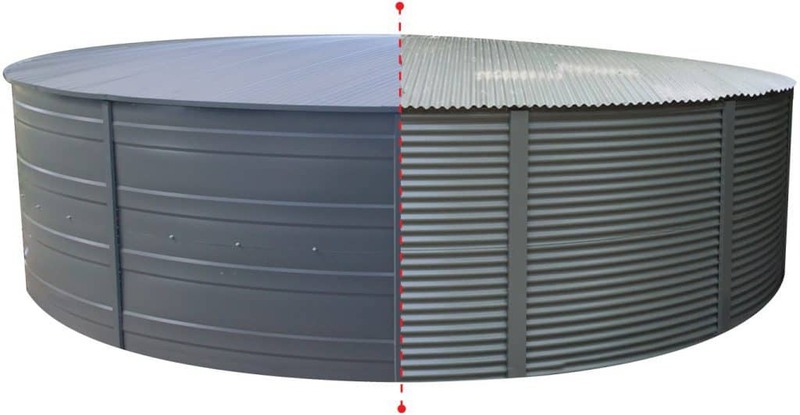 Heritage Water Tanks is very excited to announce that we have launched a new range of water tanks with an attractive 1mm corrugated profile. Knowing the market as we do, we decided to offer an attractive new option to provide our customers with more choices. We’ve designed this new product with the same superior quality as our traditional Streamline Tank range, including the same 1mm tank wall thickness and liner quality as before. In fact, everything about our new tank, aside from its appearance, is the same as our traditional Streamline product. Heritage Water Tanks unique gutter system is also compatible with this new product. Our tanks have a 20 year pro-rata warranty and have 1mm BlueScope Steel walls, which are much thicker and therefore stronger than many others on the market. Heritage Water Tanks also have a superior industrial quality Arma liner that has a density of 700g/m². Independent testing identified our ARMA Liner as the best in relation to Shear Strength, Tear Strength and Density, compared to the Aqualiner and Infinity liners of our competitors at that time. Many of our competitors offer tank liners of varying quality and performance. We stand by our Arma liner and have conducted independent testing on our product, providing the confidence you need to make the right choice. Our liner stands out in all three critical measures of durability, including liner density, shear strength and tear strength. Our liner meets the requirements for the Australian Standards Certificate AS 4020 and is 100% BPA free. The quality of our products ensures that you can have peace of mind that your tank will last the test of time. Heritage Water Tanks is an innovator and trailblazer in the water tank industry and is proudly Australian owned and operated. An icon of the traditional Australian rural outback, large steel water tanks have always been a part of the landscape around farmhouses and homes on large and small acreages. Steel water tanks are also increasingly seen in use as Fire Tanks on commercial properties and mine sites throughout the country. Our domestic and rural tanks range from 55,000 Litres to 375,000 Litres and we offer a wide range of COLORBOND® colour options. We also lead the field in innovation and technology advancement in the Water Tank Industry and have developed a unique waterwise gutter system, which allows you to catch additional water from the roof of your tank. Heritage Water Tanks provides the best value products and are a trusted leader in the Industry. We have been relied upon to provide quality rainwater tanks in every state of Australia for over 15 years. Our reliable agents and efficient tank installers are operating in every region in Australia, including remote locations in Central and Northern Australia. We also have an extensive network of wholesalers, so no matter where you are, we can provide for your needs.